DENNIS DECONCINI (Retired) is a Shareholder and founding member of the Firm. He served as Pima County Attorney from January 1972 until mid 1976 when he ran for the US Senate. 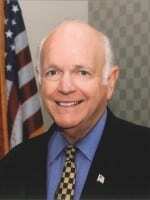 Mr. DeConcini served in the United States Senate for three terms as a Senator from Arizona. During that time, he served on the Appropriations Committee, Select Committee on Intelligence, Judiciary Committee and the Commission on Security and Cooperation in Europe (Helsinki Commission). Mr. DeConcini received his B.A. from the University of Arizona in 1959 and his LLB from the University of Arizona in 1963. Mr. DeConcini is a member of the Arizona Board of Regents, the State Bar of Arizona, Pima County Bar Association, American Bar Association and District of Columbia Bar Association. He is also a member of the Board of Directors of the National Center for Missing and Exploited Children and the International Center.